The Elections Comission named its three appointees to the Redistricting Task Force at its June 15 meeting. Six more are to be named — three by the Board of Supervisors and three by the mayor. Elections named David Pilpel, Melissa Tidwell and Mark Schreiber. Pilpel is a regular at city boards and commissions and frequently testifies at hearings. Melissa Tidwell is the Corporate Counsel at Google. All Election Commission application bios are linked below in this story as a pdf. Fifteen applications for the Board of Supervisors’ appointments to the Redistricting Task Force now are on file, while the Elections Commission has scheduled a meeting for June 15 to begin selecting its appointments. The nine-member Task Force includes three appointments from the Elections Commission, three from the Board of Supervisors and three from the mayor. The mayor’s office has not announced when it will begin accepting applications. The fifteen applicants pending at the Board of Supervisors include five who also applied with the Elections Commission. They include the diversity of San Francisco’s ethnic communities and a reasonable cross-section of the city’s neighborhoods, from the Marina to the Avenues, Chinatown to the Mission. Most applicants come with seasoning in outreach through work with community nonprofits, particularly in housing. Also among the applicants is Paul Hogarth, longtime managing editor of Beyondchron.org as well as the CEO of the United Way. Here is the alphabetical list of the submitted applications, with a redistricting tf-bd1 to the pdf that contains the full applications from each. The date for a hearing as well as a deadline for applications has not yet been set. * Kathleen “Kat” Anderson, 94123 Avila Street, an attorney on employment discrimination and labor issues. Director of the Marina Community Association. * Ron Dudum, 31st Avenue, property manager, member of Arab and Palestinian communities, board candidate four times over past 11 years. * Rachel Ebora, 94110, Ex Dir, Bernal Heights Neighborhood Center, identifies as Filipino, lead and designed outreach program for Census 2010. * Jenny Lam, Director of Community Initiatives at Chinese for Affirmative Action, Diamond Heights Blvd, identifies as Chinese. The Election Commission applicants came from diverse backgrounds, but many did not include information on which part of the city is their home or their ethnic background. Those factors could be decisive in a final selection process as appointing officials seek to ensure that the city is well represented on the Redistricting Task Force. Downtown groups showed their strong interest in the outcome of redrawn lines for electing supervisors for the next ten years. Among the applicants is Ken Cleaveland, government relations director and lobbyist for the Building Owners and Managers Association, Daniel Scherotter, past president of the Golden Gate Restaurant Association, Ted Lowenberg, a leader in the “Civil Sidewalks” ballot measure, and Melissa Tidwell, Google’s corporate counsel. Several applicants previously sought election to the Board of Supervisors. They are Ron Dudum, Steven Moss, Owen O’Donnell and Kat Anderson. If the list of applicants tilts in any direction – perhaps more to the moderate than reform-minded side of city politics – it is also dense with serious-minded residents with a record of accomplishments. Several are published authors of professional papers on voting and political engagement as well as authoring books and professionally lecturing. Several are experienced professionals in computer analysis of data. The candidates include Asian Pacific Islanders, African Americans, LGBT members, Jewish community leaders, and retired white males. Only a handful of the applications released to the public indicate which neighborhoods are included; the city’s West Side appears to have the fewest applicants. The 2000 District Elections Task Force hired outside staff to develop various scenarios based on census and other data in an effort to fashion districts that allowed for full inclusion under the Voting Rights Act and represented common challenges and interests in their make-up. 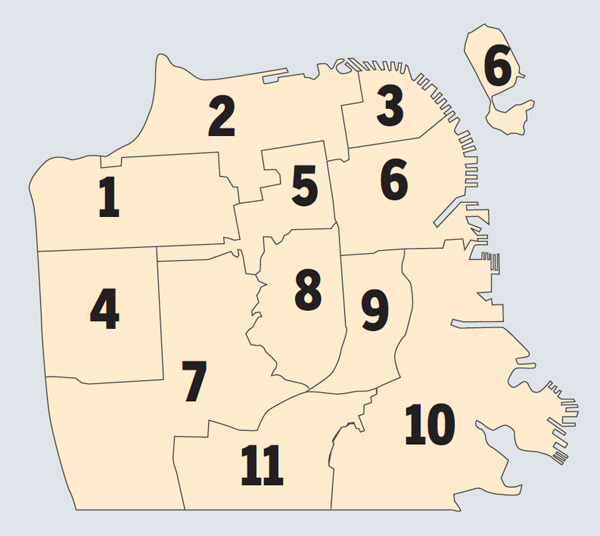 While differences of opinion are to be expected, the 2000 Task Force appeared to be heavily influenced by then-mayor and former Assembly Speaker Willie Brown who was an expert at drawing legislative districts that resulted in the outcome that continued to give him control over the state assembly. The 2000 Task Force narrowly rejected one proposal that was interpreted by critics as primarily designed to enhance the prospects of Brown-backed candidates, and passed the current district lines on a 5-4 vote. The swing vote that year came from John Trasvina, an Elections Commission appointee who currently serves as the Assistant Secretary at HUD for Fair Housing and Equal Opportunity in the Obama Administration. Below is an alphabetical list of the applicants with a one or two word description based on their applications. Kathleen Kat Anderson, attorney, former aide to State Senator Carole Migden and D2 candidate. Gia Daniller-Katz, Jewish Community Relations Council Government Relations Director 1999-2003, Senator Barbara Boxer Northern California field representative, worked in Washington for Sen. Dodd and briefly at White House police office. Brigette R. LeBlanc, African American background, has consulting business and past work in Sean Elsbernd’s 2004 supervisor campaign and Newsom for Mayor 2003 campaign. Kevin Malone, involvement in community political clubs, Toklas, Wallenberg, Stonewall, District 8. Mayor Lee’s Vacant Administration — UPDATED! City Commissions: No Time for Minutes? What’s Next For the Elect Ed Lee Effort? Open Letter to Ethics Commissioners: Get to Work!